Outkast’s second album, also called ATLiens, was a bridge between their insanely promising debut, and their polished masterpiece, Aquemini. With a general theme of outer space and extraterrestrials among us, Outkast included, jams such as Elevators, 13th floor, Two Dope Boyz define and highlight ATLiens. The breadth and depth of ATLiens is unparalleled in rap history, and the ease that Big Boi and Andre are able to completely switch sounds, content, and style on individual tracks shows their unreal musical versatility. While the whole album is one giant jam and a half, and many song could have higher lyrical merit, or a sicker beat, none of them are more a jam of a half than the album’s title song. 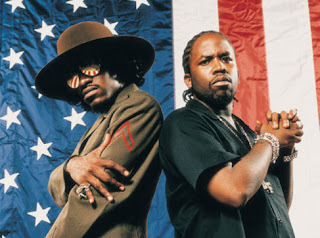 Outkast is what Southern Rap could be…no, Outkast is what Rap should be. Over a pounding Outkast/Earthtone Ideas beat, both Dre and Big Boi lay down lyrical magma. Big Boi starts off, laser beams blazing. Did he just say he was cooler than a polar bear’s toenail? Yeaaa he did. Did he say it tickles to see you try to be like Mr. Pickles? Uh huuu…Did Dre tell you that he put his glock away because his lyrics are “a stronger weapon that never runs out of ammunition”? Si chaval. ATLiens (the jam, not the album) may not be the most introspective, otherworldly Outkast jam of all time, but play it a couple times. It's two rappers, who on only their second album, are asking the world, who better? ATLiens is the jam and a half.